With 80GB or 160GB of storage, iPod classic gives your music and video room to move. It also has plenty of energy (up to 40 hours of audio playback), good looks (a sleek, all-metal design), and a great personality (a brand-new interface with Cover Flow). In other words, iPod classic makes an ideal companion. 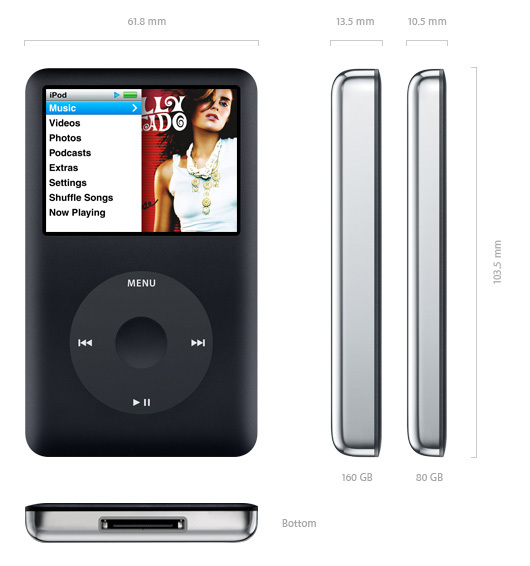 With 80GB or 160GB of storage, iPod classic gives your music and video room to move. View iPod classic dimensions. Up to 40 hours of audio playback in the palm of your hand. View larger. 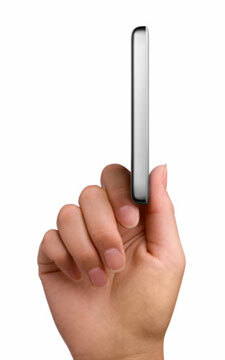 Thinner and more compact than ever. The digital shelves of the iTunes Store are stocked with thousands of audiobooks–including exclusives like the entire Harry Potter series–so you can catch up on your reading wherever iPod classic takes you. iPod classic recognizes where you left off and bookmarks your place. You can even adjust the reading speed to suit you. Put hours of fun at your fingertips. iPod classic comes with three games–Vortex, iQuiz, and Klondike–and you can download more from the iTunes Store for $4.99 each. All iPod games are designed specifically for the iPod interface. And all of them look great on the 2.5-inch color display. iPod classic holds up to 25,000 photos you can sync from your Mac or PC via iTunes. Use the Click Wheel to scroll through photo thumbnails the same way you scroll through song titles. To see a photo full screen, click the center button. 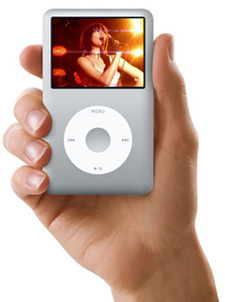 You can even view photo slideshows–complete with music and transitions–on iPod classic or on a TV using an optional Apple component or composite AV cable. 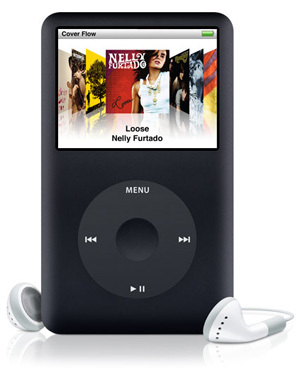 With up to 40,000 songs on your iPod classic, you need an easy way to search your collection. A built-in search function lets you use the Click Wheel to type out the name of the song, artist, album, audiobook, or podcast you’re looking for. iPod classic returns results instantly as you select letters.